As I write, it's a balmy 19 degrees in Whitehorse in the Yukon of Canada. It gets a lot colder, I'm sure. The town is nearly on the same latitude as Anchorage Alaska. Why all the meteorology and geography? Out of the frozen tundra of Whitehorse comes a smokin' hot traditional metal band, Sanktuary with their second album, Winter's Doom. 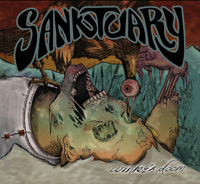 Eschewing most modern trends, Sanktuary plays a combination of traditional heavy and speed metal. Basically, it's a massive amount riffage from twin guitars, soaring leads from the same, wrapped in throttle busting speed which, in turn, is powered by a dynamic rumbling rhythm section. As to those guitars, if you're somewhat of a lead guitar solo geek such as my self you won't be disappointed here, rather thrilled at the fret board fireworks. Alan Binger's vocal style is assertive, more than a little rough and raw. He could probably do death vocals at the drop of a guitar pick. Thankfully, he doesn't. So you're waiting for the "but" like what's the downside. Maybe not so much a negative, but what I described of their music is basically what you get from start to finish. So there's a certain amount of redundancy here or consistency. It all depends on your perspective. Only the opening moments of Curse Of The Vermin slows things down, making you think something like doom metal is upon you. Nope. That's get speedy pretty damn fast. 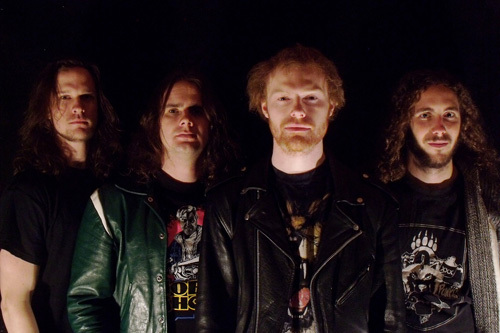 Bottom line: with Winter's Doom, Canada's Sanktuary plays tried and true heavy speed metal, and they do it with skill and enthusiasm. Recommended. With Winter's Doom, Canada's Sanktuary plays tried and true heavy speed metal, and they do it with skill and enthusiasm. Recommended.